Inexpensive, cheap commercials for your website, done professionally and good enough to be used on Cable TV. Just because you got a deal, or it was inexpensive, does not mean it will look like it. Look at how cheap pictures are to acquire for your website. Yet they sure ad a lot of interest to it. Cheap is a word no one likes to use, but they sure do like getting things cheap, don’t they? I use the word cheap commercials in this post, for folks who used that term when Googling to seek out a ‘deal’ or to spend a lesser amount, then they would with a pay-per click Website. After all those Pay-per-click sites need to recoup that overhead. Right? You want to find a place that does inexpensive or cheap commercials? You found us. We can do a simple low budget montage and voice over to Ferrari’s and a dozen models. All on the Cheap. How can we do commercials so cheap? First off, because of technology and the fact we all have a computer now. Software for this kind of thing has come down in price. That savings is passed on to you. It used to be, that one had to spend a minimum of 3500 for a High Definition camera, now that is all you can find. That same technology has brought computers and software prices down that were in the 10’s of thousands needed to create a commercial or at least to edit it. Why do we create cheap commercials for websites? We love doing our job. It is what we enjoy doing. The cheaper commercials are the more we get to do. That simple. Tell a friend! Instead of paying a graphic artist a bundle, to lay out your website. Just to trim Jpg’s and create Gif’s for your website. Consider this. 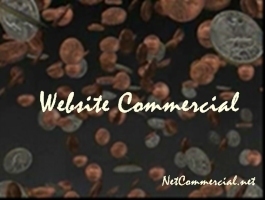 Use Netcommercial.net and have all your information or sales jargon and pictures canned, into some inexpensive cheap commercials, for about the same cost it would be for a Webmaster to do all that layout on your website? Isn’t that what a Webmaster is trying to achieve? Placing all your ad ‘pitch’ into a nice flow, like a still website commercial? Telling you it takes hours of coding to get it ‘just right’. Probably so, I hate coding or HTML, I would rather shoot video. Now, have your Webmaster concentrate on Keywords and Ranking. The results would be a modern looking website. The natural progression of the net… A Website with inexpensive, cheap Commercials, along with strong keywords and ranking. Maximizing your advertising dollar. Those cheap commercials can be used for more then just your website commercial. Your website commercial can be used later on Cable T.V. when and if, you get to that point in your business. Or use it in a Kiosk, even a showroom floor or simply a store front window. It is all in the format it is saved in. With the cost of a DVD player, small flat screen and plumbing a speaker to the outside of a store front; one can Loop their inexpensive, cheap commercials to passers by. That is another thing that is cheap, like these cheap commercials. DVD players can be had for 39. bucks and a flat screen can be found for 150. bucks. A classic example would be a travel company’s store front, for instance. What would be better, small, cheap commercials that loop with action and tropical music, with sunrises and sunsets and ocean surf, people having fun? Or just a Poster of the beach and the name of the beach? C’mon just the description makes me want to get on a plane and get there. A personal professional video website commercial for your business will deliver that message, slogan or brand you want to deliver every time, all the time 24 hours 7 days a week. You will find comfort in knowing that every time a potential client comes to your website, store front or passes by your kiosk, they get the message you wanted to get across, instead of hoping “they noticed it” “If” they even bothered to read your content at all. As we all know, people do not like to read. Personally, I feel that most people are lazy by nature and prefer pictures or video over reading. I know, I am guilty of it… I have felt in the past, as though I am being patronized as someone curses over a flier of information I have spent countless hours preparing. When my message I wanted to present to them, is briefly or barely taken in; as though they are assembly instructions for a swing set. I have found that by giving someone the “short and skinny” or condensed version they are more apt to retain and recall something more then if I give them the whole run down or “nuts and bolts” of something. After all, wouldn’t you rather just push a button and have it read for you? Like my Listen Now button above…(make sure your speakers are on) Thanks again. Once again to be to considered a real comment and not spam please use the words Cheap Commercials in your post.